Parliamentary elections in Ukraine Sunday delivered victories to a number of right-wing nationalist parties in a vote that was boycotted by the vast majority of the electorate in the country’s east. Exit polls indicate that the Bloc of Petro Poroshenko, Ukraine’s president, obtained 23 percent of ballots cast, followed by the People’s Front of current Prime Minister Arseniy Yatsenyuk, which garnered upwards of 21 percent. Trailing behind these two blocs was the Self Help Party, which reportedly got just over 13 percent of the vote. Polls closed at 8:00 pm local time, and as of this writing, turnout is estimated at about 40 percent, with large differences between the east and west of the country. If accurate, this would represent a major decline in the overall level of voter participation compared to previous elections. 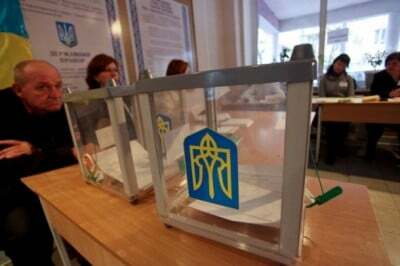 In Ukraine’s 2012 parliamentary race, 57.4 percent of eligible voters cast ballots, according to data available from the Institute for Democracy and Electoral Assistance. It is estimated that between three and five million eligible voters concentrated in the east and southeast of the country—between ten and twenty percent of the total electorate—did not participate in the elections. Elections were not held in Donetsk or the Luhansk People’s Republic, which declared the October 26 vote a “farce” and scheduled their own votes for early November. Even in areas under the central government’s control, turnout was low in regions with widespread popular hostility towards the Kiev regime. The Central Election Committee estimated voter participation in the southwestern city of Odessa at just 13.2 percent, and in Donetsk and Luhansk at 14.6 and 13.1 percent respectively. In May, dozens were killed in Odessa when pro-Kiev fascist forces trapped anti-government protesters in the local trade union building, massacring them and then setting the building alight. President Poroshenko has said he is prepared to form a government with the all of the “parties of the Maidan,” referring to those political forces that backed the right-wing coup that ousted former President Viktor Yanukovych last February. In addition to his own bloc, the People’s Front, and the Self Help Party, this includes the far-right Radical Party of Oleh Lyaschko, the ultra-nationalist Svoboda Party, and the Fatherland Party of oligarch Yulia Tymoshenko, which respectively won 6.4 percent, 6.3 percent, and 5.6 percent of the vote, according to early estimates. All of these political formations represent one or another variety of pro-market, anti-Russian, militarist forces. Lyaschko’s Radical Party endorses the nuclear rearming of Ukraine. The lesser-known Self Help Party, which describes its program as rooted in “Christian morality and common sense,” calls for an end to Ukraine’s non-aligned military status, the production and purchase of modern military materiel, and a new military doctrine for the country. Tymoshenko’s Fatherland Party, out of which a number of People’s Front deputies emerged, is notorious for its leader’s call for a “scorched earth” policy against the region’s Russian population. President Poroshenko has stated that he will begin the formation of a government on Monday, even though early official estimates of the vote will not be released until that very day, with a final tabulation coming next Sunday. The People’s Front, which will be Poroshenko’s main coalition partner, is pressing for the retention of Prime Minister Arseniy Yatsenyuk in his present post. Yatsenyuk, who has been overseeing the initial implementation of International Monetary Fund austerity policies in Ukraine, was identified as Washington’s chosen candidate to head the government in a leaked telephone conversation in the lead-up to the ouster of Yanukovych. The Opposition Bloc, which is largely made up of individuals from former President Yanukovych’s Party of Regions, won 7.6 percent of the ballots cast according to most exit polls. However, an analysis conducted by the Research and Branding group for the television channel “Ukraine” estimated the Opposition Bloc’s vote to be significantly higher, at 11.12 percent, and that of the Self Help Party to be just 10.86 percent. If accurate, this would make the Opposition Bloc the third-place winner in the elections. For its part, the Opposition Bloc has already declared its readiness to work with “partners” that share its “ideological principles” in the newly formed parliament (Rada). Given the composition of the Rada, this would imply that it is prepared to come to an accommodation with any one of numerous right-wing forces in government so long as it is able to secure political benefits for itself. Right Sector, the fascist outfit whose members have served as shock troops for the government’s military actions in the east and staged neo-Nazi rallies in Kiev, as well as carrying out violent assaults on critics of the regime, did not reach the five percent threshold to enter the Rada. In an unexpected turn, Lyaschko’s Radical Party, whose emblem is a pitchfork and whose leader is accused of organizing killings in Ukraine’s east, came nowhere near its predicted second-place win. The Poroshenko government aims to use the election to provide a democratic fig leaf for the imposition of austerity measures demanded by the IMF and European Union, and the crushing of all opposition to its right-wing, nationalist program. He and the Western media are hailing the election as a triumph of Ukrainian democracy and a sign of the population’s “pro-European” orientation. This is part of the effort to lend legitimacy to the civil war being carried out against pro-Russian separatist regions in the east and the implementation of deeply unpopular cuts to social spending. On Sunday, Poroshenko proclaimed the elections to be a “death sentence” for the Communist Party, which did not meet the threshold to enter the Rada. The government is preparing to outlaw the party.